Introduction to three-dimensional fibrous assemblies; Applications of three-dimensional textiles; Multi-axial warp-knitted (MWK) fabrics; Multilayer woven fabrics; Tensile properties of multiaxial warp-knitted (MWK) fabrics; Bending properties of multiaxial warp-knitted (MWK) fabrics; Formability of multiaxial warp-knitted (MWK) fabrics; Permeability of multi-layer woven fabrics; Using multilayer woven fabrics in resin transfer moulding. There have been important recent developments in the production and application of three dimensional fabrics. These 3D textile structures have great potential for new fabrics and textile applications. 3D fibrous assemblies summarises some key developments and their applications in the textile industry. The book begins with an introductory chapter which defines the concepts and types of 3D fibrous assemblies. The book then discusses how 3D fabrics can be applied in textile products. These range from composites and protective clothing to medical textiles. The remainder of the book reviews the two main 3D fabrics; multi-axial warp knitted fabrics and multi-layer woven fabrics. Themes such as structure, manufacture, properties and modelling are considered for both fabrics. 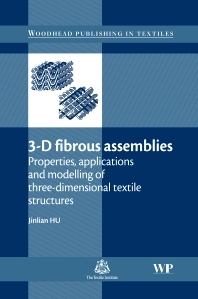 Written by a distinguished author, 3D fibrous assemblies is a pioneering guide for a broad spectrum of readers, ranging from fibre scientists and designers through to those involved in research and development of new generation textile products.